Chorleywood. The Old English word for a free peasant lower than the rank of nobleman was ceorl and these people once had an encampment on a site near here. Recorded as Charlewoode in 1524 although the name is of an earlier origin and is derived from the Old English ceorl (the group name of the people) and leah, 'a wood' - 'the wood or clearing of the free peasants' and known as Chorley Wood by 1730. 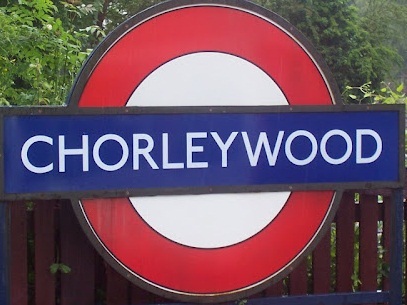 The station opened as CHORLEY WOOD on 8 July 1889, and was re-named CHORLEY WOOD & CHENIES in November 1915. It reverted to CHORLEY WOOD during 1934 until about 1964 when the single word CHORLEYWOOD appeared on maps and later on platform signs.